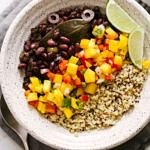 A nutritious and delicious mix of black beans, quinoa and mango. Cook the beans in your instant pot, slow cooker or on the stovetop. *No need to soak the beans. Add all the ingredients for the cuban black beans, except the vinegar, to the bowl of the Instant Pot and give a good stir. Position lid to lock, and turn the vent valve at the top to its SEALED position. Press the BEANS/CHILI button, and adjust the mode to NORMAL for soft, tender beans, or MORE for very soft, almost mushy beans. Alternately, press MANUAL, then HIGH PRESSURE and set timer for 25 minutes for soft beans, or 30 minutes for very soft beans. When timer goes off, let pressure release naturally for at least 25 minutes. Carefully turn vent valve to open, let remaining pressure release and remove lid. Add the 2 tablespoons of vinegar (this step will brighten the overall flavor and I highly recommend not skipping this step). Season with salt & pepper to taste. Remove bay leaves before serving. Serve immediately or leave on KEEP WARM until ready to serve. Add all the ingredients for the cuban black beans, except the vinegar, to the bowl of the Instant Pot and give a good stir. Place lid on top, cook on high for 6 to 8 hours. Will be ready when beans are soft and tender throughout. *Soak the beans FIRST. In a large pot, use enough cool water to cover the beans by about 2 inches. Cover with a lid and let soak overnight, or at least 8 hours. Add in the beans, water/broth, bay leaves, cover and bring to a boil, reduce heat to medium-low and cook 50 – 60 minutes. Beans are ready when they are soft and tender throughout. In a medium pot, place quinoa, garlic powder, salt and water. Bring to a boil, cover, reduce heat to low and simmer for 15 minutes. Remove from heat, uncover and let rest for 10 minutes. Fluff with fork, set aside. Serve the beans along side the quinoa, and top with mango salsa. Add a squeeze of lime over top and add some sliced/diced avocado if you have one hand. Serves 4 – 6. Store leftovers in an air tight container in the refrigerator for up to 5 days. The spices are fairly minimal. Their presence should give just a hint, but if you love cumin feel free to add a little extra. Go ahead, it’s ok! For the liquids, I used water instead of broth which was good, but using broth would add even more depth and flavor. If using canned beans instead of dried, use two 14 oz. cans, drained and rinsed. I only suggest using canned beans for the crockpot and stove-top methods at this time as I don’t enough experience with canned beans in the pressure cooker to suggest a cooking time. Substitute the water/broth amounts using 1 1/2 – 2 cups of water/broth in the slow-cooker, and 1 – 1 1/2 cups on the stovetop. Start with the lowest amount, adding more if needed. It’s not supposed to be soupy, but some liquids are fine. It will thicken overnight too. Feel free to omit the green olives and/or jalapeno in the beans. If using the linked recipe for the mango salsa, there is already jalapeno in it. The nutritional information includes a serving of cuban black beans, quinoa and mango salsa together.